Over the course of a year, I speak with literally tens of thousands of dentists, hygienists, assistants, office managers and front desk staff. 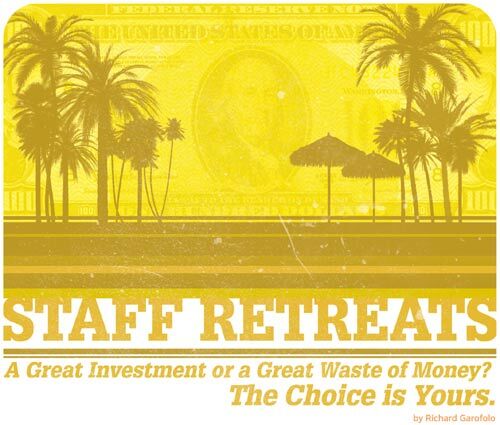 One question that I am asked by many of them is, “Should I have a staff retreat, and why?” There are many important factors to take into account when thinking about having a staff retreat, and the first one is why you want to have it. Many dentists tell me that they would like to have a staff retreat as a thank you to their staff for the great job they do all year long. That isn’t a staff retreat, that’s a staff appreciation week (or weekend or day). In our office, we take one day a year when we close the office, and we take the entire staff to New York City for the day. We walk around, shop, eat, sightsee and take in a Broadway show before taking the last train out of the city and back home. That is the “Thank You” for our staff, not a retreat. We do not discuss strategic planning, internal and external marketing or business at all. A staff retreat can be used on a small scale as a reward for hitting their goals, or as an employee “Thank You,” but staff retreats are really meant to reach a very specific set of goals that the business owner and management have decided are important to them. Without these clearly defined goals, there is no way to know if your retreat has been a success or not. You need a thermometer to measure things, and your goals are that thermometer. Doing the following activities outside of the office decreases the stress that your staff feels during regular staff meetings in the office and creates “outside” relationships that can grow in the office and improve staff moral and the teamwork attitude that every office needs and craves. The location and duration of your staff retreat can have a very real affect on the productiveness and effectiveness of the retreat. You must take into consideration your budget for the staff retreat. If the weather is agreeable and money is tight, a local park with some picnic tables can work well. On the other side of the spectrum are the offices that will take the staff and spouses on a weeklong cruise. Most offices fall somewhere in the middle. A weekend away at a moderately priced (do not read cheap) hotel will tell your staff that you care and appreciate them, while providing a meeting room for the actual business and team building parts of the retreat. Take into account scheduling, budgets and desired outcomes as you consider the location for your staff retreat. The important thing is that people are relaxed and comfortable. Before deciding on a location, think about what type of retreat you would like to host. Are you going to concentrate on team building to increase moral in the office? Would you prefer a brainstorming session, talking about ways to increase production, effectiveness of the staff, ways to improve the patient experience in your office, starting from the first phone call to the minute the patient leaves the office for the first time? Strategic planning is important for any business. Try dividing your staff into teams, giving each team one project or problem to address, and define a clear amount of time when they come back to the whole team and present their three solutions or ideas. Let the entire team discuss these limited ideas, concentrating on finding the best possible solution or concept. Training is one of the best reasons to have a staff retreat. Oftentimes, with the hustle and bustle of daily work life, we lose sight of the little things that make a big difference in our case acceptance percentages, integrating new technology or new concepts to the staff or just reiterating items that might have been discussed previously in one smooth, concise and well-planned lesson. Having a weekly staff meeting is a great start, but it is just not possible to fit all the important things into one or two hours. Look at the retreat as a refresher course. Your staff will retain much more when they aren’t worried about the perio case coming in after lunch, or rushing to get home to their hungry children at the end of the day. Once you know what type of retreat, how long you want it and where, you’ll need to focus on who will run it. Often, the owner, manager, dentist or dental spouse will take this responsibility. It must be someone who will be at ease, who will be able to put the staff at ease. This person will be responsible for making sure everyone knows the ground rules of the retreat, the agenda and what the expectations are. These things must be either laid out in advance or at the very beginning of the retreat. Many owners prefer to have an outside moderator run the retreat for them. The staff might feel more comfortable speaking their mind if they know that the moderator has set the ground rules and that everyone is there for the betterment of the practice and the business. The entire staff must feel safe and secure enough to speak their mind for the improvement of the practice. Whoever you choose to run the meeting must have a very clear understanding of what you want to get out of the retreat. Many practice management consultants offer this as one of their services, so consult with yours to see if it is something that they can offer or assist you with. Many will handle all the details from start to finish keeping in mind your budget and desired results. No matter who, where, when or what, following these simple steps will let you be certain that your staff retreat is a great success. Have your expectations laid out in advance. Remember the thermometer! Create an agenda and be sure to stick to it. Make sure that you have included time for relaxation. Down time is important and it is during these times that some great relationships can be created or repaired. Be sure that any assignments are taken seriously and completed on time. Know the ground rules and stick to them. Do not let personal feelings get in the way of productivity. Be honest and give everyone a chance to speak. While coming up with all those great ideas, be sure to include how they are going to be implemented once you get back to the office. Great ideas do nothing but collect dust if they are shelved. After you are back in the office, prepare a review form for each attendee. Be sure to ask for their complete and honest feedback on the retreat as a whole and for each individual session. If you follow these simple steps, your retreat can be the great success that you want it to be, and can be the best investment that you make in your business this year. Rick Garofolo is the president and CEO of DentalSubs.com and The Practice Mechanic (a practice management consulting company). He has spent the past 20 years in marketing, management and consulting, working with hundreds of companies all over the world. 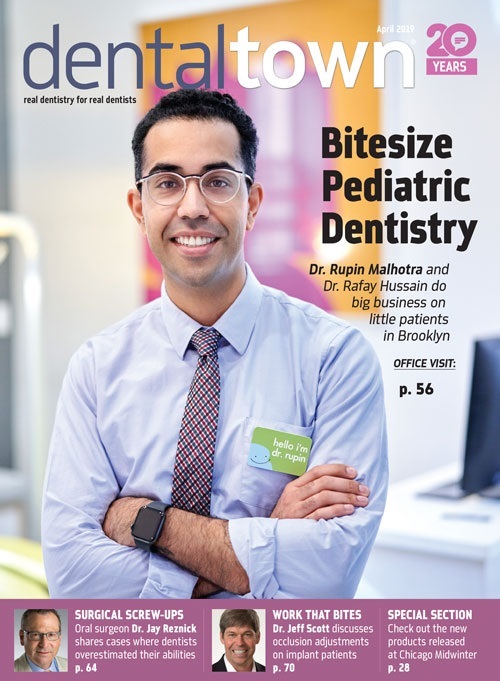 He has been called the “Gordon Ramsey” of the dental world and has produced consistent results of 80 percent revenue growth in one year or less. You may contact Rick with any questions or comments at rick@practicemechanic.com.